A watch strap, watch band, or watch bracelet is a strap or bracelet that holds a wrist watch to the wrist. Watch straps may be made of leather, plastic, rubber, cloth, or metal, sometimes in combination. It can be regarded as a fashion item, serving both a utilitarian and decorative function. 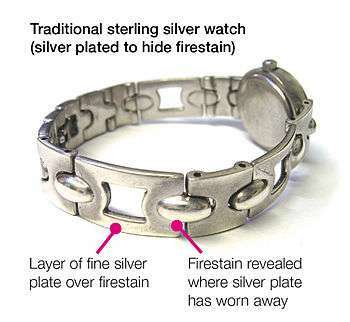 Some metal watch straps may be plated with, or even in rare cases made of, precious metals. Watch straps may close with a buckle or a butterfly clasp. Expanding watchstraps are designed to expand elastically, often by the use of metal springs in a segmented design, and may be slipped on like a bracelet. 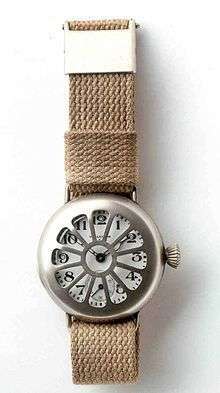 Attachment points for the strap to the watch are largely standardized, with a spring-loaded double-ended pin used to anchor the watch strap to holes in a bracket that is integral to the watch case, allowing worn watch straps to be replaced or swapped with new straps for fashion purposes. Both metal watch cases, and watch straps incorporating metal parts can sometimes cause contact dermatitis in susceptible individuals. Special anti-allergy watch straps, like a NATO style watch strap, which shield the skin from exposure to metal parts, are available for sufferers of this type of dermatitis. Specialist expanding watch straps exist for use with diving watches. With increasing depth and rising water pressure the (sleeved) wrist of a diver is exposed to compression effects that have a shrinking effect on the wrist circumference. Many watchstraps intended for diving watches have rippled or vented sections near the attachment points on the watch case to facilitate the required flexibility to strap the watch exaggerated tight for normal wear at the surface whilst keeping the watch adequately tight in place on the diver's wrist at depth. A buckle fastening for a leather watch strap. A cloth watch strap dating to World War I. A watch with a segmented metal watch strap. A silver-plated metal watch strap, showing signs of wear. A specialist expanding watch strap for diving watches.